John Turner has led an eventful life. After serving in Vietnam he joined the police, then served time in prison where he trained to become a therapist. Having tired of listening to the problems of others he moved to small rural town to escape his past but ended up drifting back into police work. After the death two year’s previously of Val Bjorn, his partner, Turner has been drifting along, taking each day one at a time, dealing with all the problems that afflict a small town in decline. Then the sheriff’s son drives what appears to be a stolen car into city hall and his old friend Eldon Brown turns up on his porch unsure as to whether he’s committed murder but knowing that the Texas police are hunting for him. Neither the son’s accident or the accusation against Eldon’s are, however, quite what they seem, and Turner has other issues to also resolve: the friend of a local commune owner is murdered whilst en route to him and a dog that won’t stop barking. 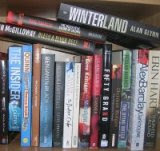 Salt River is the third book in the Turner trilogy, which ideally need to be read in sequence. At 160 pages it’s more of a novella than novel, but is, I feel, the strongest of the trilogy, in part because the plot is more central than the earlier books, which seemed to concentrate more on the telling of the story rather than the story itself. Sallis is a poet and it shows in the strength of his prose, which is evocative and haunting, dotted with acute observations and philosophical asides. 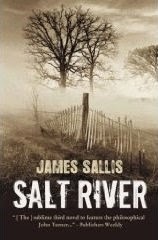 The characterisation is nicely portrayed and Sallis weaves a well developed sense of place. There is no strong hook or sense of urgency or tension, instead the narrative floats along, much like Turner does, sometimes in the flow, other times in the eddies. The result is a thoughtful, reflexive and compulsive tale about a man still coming to terms with his own bad choices and fate as he muddles through trying to resolve the various issues that are placed in his path. A superior piece of literary crime fiction. Loved this book and I got my kindle working again. When do you need it?